KC Properties is pleased to offer you this fantastic property situated in coastal town of Kavarna, within 2 km to the sea coast. It is an excellent opportunity for those who are looking for a house close to the beach, shopping facilities and amenities. The property is also great for investment as it could be easily rented out. The offered real estate represents a 3 storey massive house with total living area of 150 sq.m., which is set on 820 sq.m. plot of land. There is also a garage/workshop, fruit garden, gazebo and a small pond. The house is 3-storey and consists of 3 self-contained apartments. There is one apartment on each level with own separate entrance which makes it ideal for renting out. - Level 2 ((accessed over individual staircase) - open-plan kitchen with lounge, spacious bedroom with large walk-in closet, bathroom and toilet and balcony with views to the sea and forest. All three apartments are fully finished and furnished to an excellent standard with high quality furniture. The plot of land is grassed and landscaped, with many fruit trees. There is a garage/workshop, outside sitting area (gazebo) and a small on-ground pool. The property is situated in the coastal town of Kavarna, in a quiet area offering great open views to the sea and forest. It is also not far from all shops, cafes, restaurants and amenities in the town. Distance to the nearest beach is 2 km. 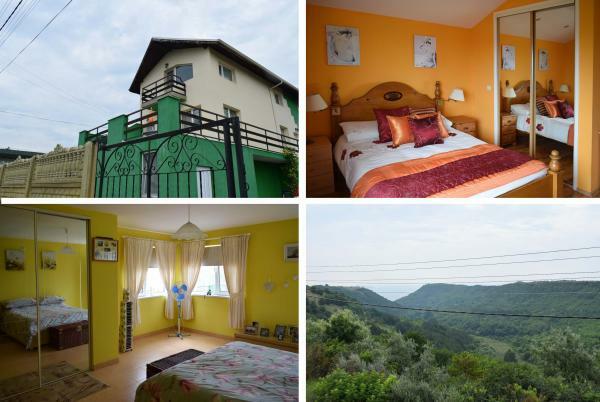 This property is located in: Cavarna, Kavarna, Kawarna (Dobrich, Bulgaria). I am interested in other Houses for Sale from Bulgaria. I am interested in other Properties from Bulgaria. We are real estate agents offering a wide range of rural properties, holiday apartments, newly-built properties offered at very attractive prices. I have seen your property for sale on SearchEurope Property Listings. Please get back to me with additional information.